For the past 44 years, Telefilm has been helping to strengthen the Canadian audiovisual industry’s ability to attain a world-class level of excellence in all areas of production. As a result, our country is home today to producers, directors, writers, actors, cinematographers and technicians who rank with the best in the world. I have had the honour and privilege, for a fourth year, to chair a Board that has a firm grasp of the issues and challenges currently confronting the industry and that supports Telefilm’s senior management as the organization embarks on a major change of direction. Our new corporate plan, which will guide us over the next four years, allows Telefilm to continue drawing on the experience it has gained in its key role as investor. The plan is also a result of the desire to change we instilled within the organization – a desire that guided all of our reflections. The many consultation sessions we organized with industry stakeholders from coast to coast confirmed an essential notion: that the future of our audiovisual industry depends on stimulating Canadians’ demand for homegrown productions. Apart from addressing the promotional challenge this represents, we also need to fundamentally alter Canadians’ perceptions so that they are attuned to the value of our films, as well as to the essential role the audiovisual industry plays in our country’s economic and cultural development. We must work together to foster a true culture of success. I would like to thank the Honourable James Moore, Minister of Canadian Heritage and Official Languages, and departmental officials for their support of, and interest in the cause of Canada’s audiovisual industry. I would like to thank the entire Telefilm team: my Board colleagues, who carry out their mandate with skill and dedication, ensuring that the organization has the tools and mechanisms it needs to operate as effectively and as efficiently as possible; Carolle Brabant, who has served as Executive Director for one year now and who has successfully assumed her leadership role; our senior management team, which oversees an effective management framework; and all our employees, for their commitment and for the close attention they pay to the needs of our clients. I would also like to thank our partners and the industry representatives with whom we engage on a regular basis. Not only does your support enhance the work we do, but it is also an indispensable part of the unique cultural heritage we are building for all Canadians, which will benefit today’s generation as well as tomorrow’s. Finally, hats off to the Canadian creators who distinguished themselves in 2010–2011 through works that truly made us proud, at home and abroad! In March 2010, I enthusiastically agreed to lead Telefilm Canada, an organization that I know very well, given that I have been working here for more than 20 years. The mandate that was entrusted to me: to translate the Board’s vision into action and dare to change. Supported by an equally enthusiastic team of managers and employees, we spent a good part of the year looking at our activities with a new eye. We consulted the industry, as well as the Telefilm team and our partners. Of all the ideas that emerged from these consultations, one in particular held our attention: the idea of launching a movement in favour of Canadian content—a movement in favour of success. This vision, laid out in our strategic plan, Fostering Cultural Success, is based on the conviction that our productions can move and attract the interest of audiences in Canada and elsewhere. Last year’s results offered convincing evidence of this. What a rewarding year for Canadian cinema! Two features alone, Incendies and Barney’s Version, took in a combined $25 million at the box office—and that was just a beginning. They also earned an impressive critical and popular success, racking up nominations during awards season. Incendies won eight Genie and nine Jutra awards, and was one of five features competing for the best foreign-language film Academy Award. Barney’s Version, for its part, won the Leoncido d’Oro at the Venice International Film Festival, as well as the Audience Award at the San Sebastiàn International Film Festival. The film also won its star a Golden Globe for best actor in a comedy and a Genie for best actor. In addition, Barney's Version received an Academy Award nomination for best makeup. In all, Canadian feature films picked up 127 prizes around the world. From Xavier Dolan’s return to the Croisette at Cannes—where his second feature, Les amours imaginaires, was screened as part of the official selection Un Certain Regard - to the world premiere of director Jason Eisener’s Hobo with a Shotgun at Sundance, Canadians were in the spotlight at several major international festivals. Furthermore, Telefilm certified 57 new coproductions, generating a total of $213 million in foreign funding support for Canadian content. We held the ratio of program management costs steady at 6.2%, in accordance with our requirement to soundly manage the public funds with which we are entrusted. We are proud to have ensured the transition of Canada Media Fund (CMF) programs and to have contributed to the launch of the CMF’s Experimental Stream. We renewed our services agreement with the CMF, at the same time marking the fifth anniversary of the partnership between our two organizations. We changed our communications practices and enhanced our promotional activities, which resulted in greater media coverage of Canadian productions - all to the industry’s benefit. We also enhanced our visibility among our clients. The launch of the Golden Box Office Award, given to English-language feature films, also helped put the spotlight on Canadian success stories. We also significantly increased our international presence by improving our microsites and conducting effective Google AdWords campaigns. Partnerships with the public and private sectors allowed us to organize a series of screenings for parliamentarians of quality Canadian films. Under the honorary chairmanship of the Honourable James Moore, the screenings began with Gunless and continued with Incendies and Barney’s Version. These initiatives were enthusiastically received and helped make political decision-makers more aware of Canadian film successes. In 2011, Telefilm is embarking on a new corporate planning cycle. This is a decisive moment for us, as we are undertaking a major change in direction in order to foster cultural success. Teams are already hard at work on three initiatives that will usher in significant changes that Telefilm and the industry deem to be important: the overhaul of our programs, the development of multi-screen promotional strategies for Canadian content and the introduction of new performance indicators. For Telefilm, these initiatives represent a stimulating challenge. The industry can count on us! Canada’s audiovisual industry has what it needs to take full advantage of the opportunities that will open up in the years ahead to exploit the value of its products. And while the challenges ahead are the industry’s own, it can count on Telefilm to help it meet them. I would like to thank our Chair, Michel Roy, and the members of the Board for granting me their trust and support throughout the year. I would also like to thank Telefilm’s employees for their commitment and support. It is a pleasure as well as a privilege to work every day alongside such dedicated colleagues, who are passionate about film and, above all, determined to ensure that Canadian creators take their rightful place at home and around the world. 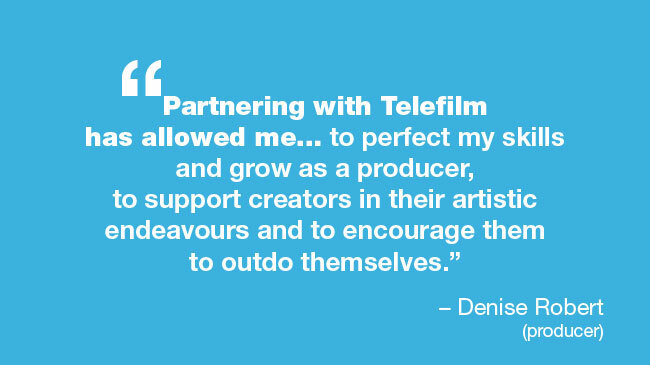 Over the past four decades, Telefilm has helped build a Canadian audiovisual industry that is now world-renowned not only for its production quality, but also for its outstanding talent. However, the time has come to address the next big challenge in the evolution of the industry. We must now focus on stimulating audience demand for Canadian screen-based content in an increasingly competitive environment for consumer time, interest and money. This new corporate objective re-energizes our mandate, and aligns our activities more closely with industry needs. We must expand our traditional funding approach by investigating alternative sources of funding for the industry, and by encouraging the development of coproductions as a way of assembling larger budgets and financing more ambitious projects. Telefilm will help the industry develop the capacity to promote its own productions in innovative ways, and complement this effort by using the resources at its disposal and key partnerships to support the industry. Telefilm has a valuable role to play by gathering, analyzing and disseminating business intelligence that will benefit independent production companies. Telefilm will always seek areas to make further gains in efficiency and effectiveness. In every region of the country as well as internationally, Telefilm will build awareness of the Canadian industry's successes. We will pursue a multi-platform digital distribution strategy for Canadian content, and investigate more sources of funding and private investment. A purely commercial definition of success has become too narrow. In consultation with the industry, Telefilm and our partners will develop criteria to measure a broader definition of success, which will include cultural, commercial and industrial indicators. We will continue our efforts to simplify programs and related guidelines while maintaining high administrative performance standards and strong accountability for the public funds we manage.